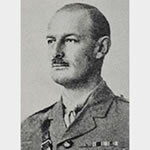 On 23 February 1917 at Shumran on the River Tigris, Mesopotamia, Major Wheeler, together with one Gurkha officer and eight men crossed the river and rushed the enemy's trench in the face of very heavy fire. Having obtained a footing on the far bank, he was almost immediately counter-attacked by the enemy with a party of bombers. Major Wheeler at once led a charge, receiving in the process a severe bayonet wound in the head. In spite of this, however, he managed to disperse the enemy and consolidate his position.